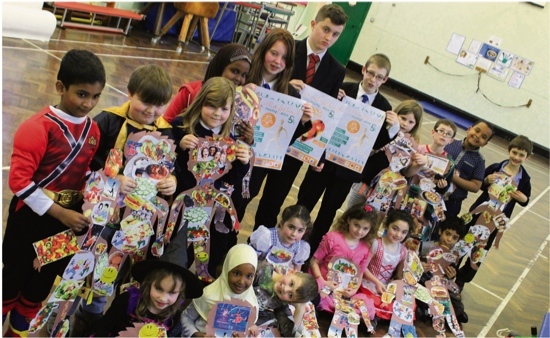 HEALTHY eating and healthy lifestyles are the themes of an ambitious festival to be held in May by a group of Bristol schools. The With One Voice Partnership – Orchard School Bristol, Filton Avenue Infant and Junior Schools, Upper Horfield Community School and Fonthill Primary – are preparing for the Staying Alive Festival. It is being organised to highlight to families in north Bristol the many fantastic lifestyle opportunities in the community with two flagship events - a healthy eating festival at Orchard School on Saturday, May 10 followed by a Get Active Festival at Filton Leisure Centre the following Saturday, in conjunction with Filton Town Council. The schools are also promoting issues around health to improve life expectancy which varies greatly across different parts of the city. A highlight of the food festival will be an attempt to set a World Record for the most diverse fruit salad with weird and wonderful fruits brought from across the globe. This event will see the communities of Horfield, Southmead, Lockleaze and Filton coming together in a celebration of healthy and tasty eating, including demonstrations and stalls featuring food from round the world, reflecting the cosmopolitan nature of the schools and communities. To showcase the event, children from the different schools will be designing special benches which are shaped like open books, similar to Bristol’s gorillas. At the Get Active Festival, families will have the chance to take part in a wide range of sports and meet representatives from clubs, and there will also be a multicultural food area. Orchard’s schools partnership manager Helen Howard said: “Staying Alive is all about promoting a healthy and happy lifestyle for all families. “Our particular focus is healthy activities and healthy eating and we will have something for everyone across these two very exciting weekends.